Stop by the CUESA Classroom for a cooking demo featuring the seasonal bounty of the Ferry Plaza Farmers Market and highlighting one of our market seller-farmers. Little Organic Farm was founded in 1995 by David Little, who takes pride in his dry-farmed produce. The farm is comprised of six pieces of land located near the ranch, totaling about 30 acres. With the main emphasis on dry-farmed potatoes, the produce variety also includes tomatoes, lettuce, greens, strawberries, squash, cucumbers, kale, broccoli and onions. The farm is diversifying it’s selection with each new season. The produce is sold at several farmer’s markets and to restaurants and wholesalers in and around the Bay Area. David Little, owner and farmer, is a third generation Marin resident originally from San Anselmo. David began to learn about farming when he agreed to help a friend on his ranch near Tomales in West Marin. He fell in love with farming and the countryside and started looking for ways to support his family on the ranch there and started farming potatoes in 1995. 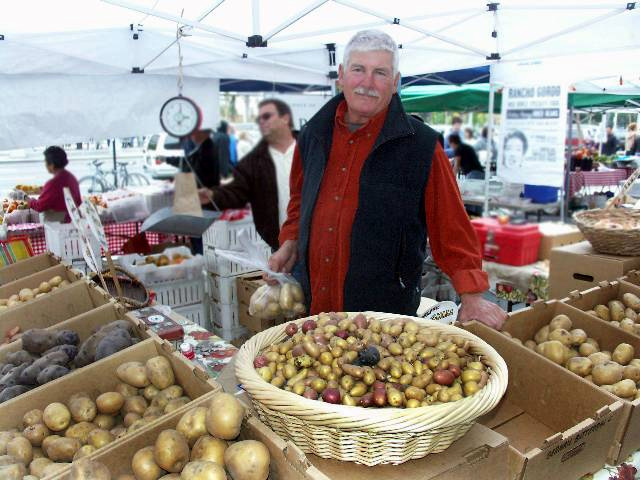 He chose potatoes because the land around Tomales was historically used to farm potatoes and was well suited to the crop. David has since has success growing onions, tomatoes, strawberries, and other crops on the farm. All his potatoes are dry farmed.